I should have known better. I should have looked at my map. I should have been more aware of my surroundings. I should have taken my hiking stick! My guide Ilian and I decided on an early morning drive to the remote Shibaoshan Cave Temples – a complex of grottoes just north of Shaxi. We invited Nicole to join us. A grotto is a small cave or cavern or a man-made shelter that resembles a cave. Did I assume that the grottoes are easily accessible? As Ilian has observed and I have already experienced, “Yunnan Province Is Mountains.” The Shibaoshan Grottoes are IN the mountains, high in the mountains, and from the parking lot, one helluva trek up the mountain path. Ilian is young and strong so he had no problem strolling up 500 meters..
Nicole, a very young and agile Chinese woman we met in Shaxi Town, skipped up the trail as nimbly as the Macaque monkeys who greeted us. The one thousand year old grotto and temple complex at Shaxi Shibaoshan is one of the best preserved treasures of ancient Buddhism in China and are a national heritage site. And yet, one website calls the site “Shrouded in Mystery.” In fact, there is no mention at all of the remarkable caves and temples in any of my three China guidebooks. 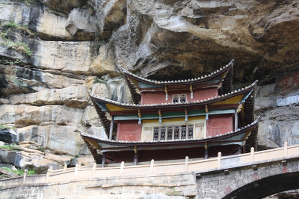 Few travelers venture to Shaxi and fewer still hike to the grottoes. The good news is that Ilian, Nicole and I were there alone. Except for one family with a little girl – cute as a monkey.